Use the comparison chart below to choose the best hunting crossbow for the money, according to our experience. 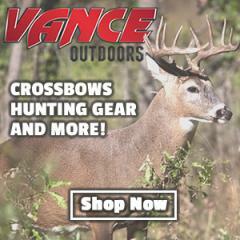 We’ve chosen these specific models to provide you with the highest possible diversity of draw weights, FPS, construction quality, ergonomic designs, safety features that are paramount in any outdoor situation, and of course weight – all of these crossbows weigh just enough to make them easy to carry, regardless of whether you use a padded crossbow sling or not. Before you buy a specific model make sure to read the detailed review by clicking the “Our Review” link beneath each crossbow. There you will find all the information you need, written by an expert who has actually used that specific model, and which includes information regarding real-life capabilities of the crossbow in a true hunting scenario. Draw Weight 185 lbs. 185 lbs. 165 lbs. 175 lbs. 240 lbs. Recommended Arrow Length 20" 20" 22" 20" 18"
Crossbow Length / Weight 36.5" / 7.9 lbs. 34.4" / 6 lbs. 8 ozs. 37.4" / 6.8 lbs. 35" / 6 lbs. 8 ozs. 35" / 5.4 lbs. What To Look For In a Hunting Crossbow? #1: It must have high enough of an FPS to make it deadly at up to 40 yards away. In practice, you’ll usually be shooting from a closer distance (usually 20-30 yards), however sometimes you won’t be able to get that close and therefore need to know you can rely on your weapon to get the job done. 250 Feet Per Second is the bare minimum velocity recommended, though you’ll notice all the selections above have 300 FPS and more. #2: It should not be too heavy. Nothing more annoying than having to carry a 10 pound crossbow around with you for hours or manipulate it on the limited space a tree stand usually provides. Some of the best hunting crossbows above are as light as 5.5 lbs, with the heaviest one being the Barnett Buck Commander at 8.1 lbs. If you do have trouble with the weight though, get a padded crossbow shoulder sling, which can be attached to all the models listed above. #3: It needs to come with a decent scope. You can obviously always get a better scope down the line, though ideally you want to receive a crossbow that comes with everything you need to start hunting immediately without wasting time. A decent scope needs to hold zero for a very long time, come with 3 dots or reticles ideally, and not deplete the battery every few months. #4: it must allow for a dependable, quiet and smooth cocking. Nothing worse than scaring away your prey when cocking the crossbow due to it being too loud. The models compared above all have dependable cocking and latching action. Of course, there are other important factors to consider, such as how comfortable the crossbow is to hold, how consistent its accuracy is (this depends on string, limb, and rail quality), not to mention trigger action. These elements are pretty much a given though with the majority of modern crossbows made by respected manufacturers. If uncertain, just check out our reviews. No matter how strong you think you are, I strongly recommend getting a rope cocking aid, if the crossbow package you choose does not already include one. You may be able to easily dead-lift 200 pounds, however consider that when cocking a crossbow the string will be digging quite deeply into your palms. Also, you’ll likely be cocking it repeatedly in a row (though not always), in which case it can get tiring without some sort of assistance. If getting a crossbow with more than 200 draw weight, consider getting a crank aid, which makes the cocking process pretty much effortless. To learn more about the different cocking methods available and what their pro’s and con’s are, take a moment to read our main crossbow guide – particularly the section on cocking your crossbow. Oh, and don’t forget to draw the string evenly on both sides of the stock, as uneven cocking is the most common mistake leading to shooting accuracy problems. What To Take With You On a Hunting Trip? A screwdriver or coin. You might need this in the field if your crossbow requires elevation or windage adjustment. See our crossbow sighting guide for more details. A flashlight. You never know when lighting conditions might suddenly get worse, in which case not having a flash light can make it all but impossible to track the blood trail properly. Spare batteries. Keep in mind that most modern red-dot and reticle scopes are powered by small batteries. Don’t forget to always to always turn off your scope when not in use, and keep that spare battery with you just in case. Spare string. This is always a good thing to have. On most modern crossbows, the average lifespan of a quality string is approximately 200-300 bolts fired. Of course, you do not want to wait for the string to break, and you should replace it as soon as you start noticing obvious signs of wear / serving separation. Lubricant. During a hunting trip, you’ll likely be handling your crossbow in different manners, which could in some cases remove any lubricant that you may have applied before embarking on your trip. Having some spare lube is always a sound idea. The instruction manual. This goes for beginners only, who do not yet feel 100% comfortable servicing their crossbow. You never know what might happen and which could require you to disassemble and reassemble parts of your weapon. A charged cellphone. Just in case of an emergency or if you need to call for help; better safe than sorry. We went over this in much more detail in our hunting broadheads guide. The important thing to remember is the broadheads should be of the same grain as the field points that came with your hunting crossbow package. Make sure to take a broadhead wrench with you, as it is easy to cut yourself in the field in the spur of the moment while manipulating the sharp edges, especially since you are likely to be distracted by all the things happening around you. Please remember that, above all, hunting with your crossbow should be fun and exciting. Don’t pursue the highest possible draw weight and highest possible FPS just for the sake of it; make sure that you can handle it, and that carrying and cocking the crossbow does not become a burden. If you want to take a look at a wider selection, take a look at our comparison of the top 10 best crossbows. i am looking at getting my first crossbow for hunting which one would u recommend? I am looking in the price range of 400 and under and need it to last for along time. Hi Chris. The Barnett Jackal might be appropriate for you. 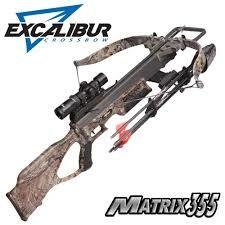 Get yourself a Excalibur Matrix 380fps Best in the World. challenge with more primitive weapons, I never thought I would gravitate away from my firearms or my Matthews bow and spend as much time shooting my Intercept Axon as I have, I truly give it or any high quality crossbow a thumbs up. I am not trying to promote for the company in any way, I just want to share my experience and how pleased I am with a crossbow. I am looking to buy my first crossbow for hunting. What crossbows would be best for a short (5′) woman to compare, prior to purchase? Which one would you choose, if you were my size? Hello, great site! I’m looking to help my adult son locate a good hunting crossbow and I’ve read a bunch of your reviews. In particular, because I have inside access to purchase one, the SA Sports Ambush and Empire Terminator models. In the reviews you said you wouldn’t use the Ambush for anything larger than deer, but that the lower energy Empire Terminator would be suitable for deer, elk, black bear and wild boars. I tried to find a guide by total energy at impact recommended for different species but couldn’t locate one anywhere online. We are in NJ and they just approved a bow season for black bear so I want to get it right. Do you have such a guide or, if not, could you create one to post here on your site? Hi Have you had a chance to test the Killer Instinct 350 Yet ? Be interested on what you find. the best crossbow made is the hickory creek in line. try one and tell me i’m lying! What can you tell me about the 2015 Stryker Offspring? I’ve seen good reviews but haven’t been able to shoot one. Never used it I’m afraid, and neither has Jeff (we write the reviews together). We’ll try to give it a go over the next week or two, if possible, and will update you via e-mail if you’d like? The Barnett Jackal is an all around excellent crossbow at a great price, and I always recommend it to beginners who don’t want to pay much and yet want to be able to hunt. Another option is the Wildcat C5. Generally look towards Barnett as they have in my opinion the best “bang for your buck” crossbows at a budget. I am looking at a parker enforcer 160. It is brand new , 380. $ never fired. Is the barnett jackal a better hunting crossbow than the parker? It is rated higher by some people. I like the axiom a few. It is rated in your review as the best hunting crossbow under $600. At that price I can afford it. However when I click on you “best online price” it goest to Amazon whose lowest price for it is $1367.54. Is this a mistake on the part of Amazon. Where else. Ought I look for a better price? it’s definitely an error on Amazon’s side, I’ll look into it. Thanks for letting us know. looking to purchase a crossbow for the 2016 hunting season. 64 years old excellent health. have hand tremors(all my life). heavy compounds is what I’ve been using. 30 yards has been my max reliable range. wanting to extend out to 50-60 yards. bow weight not a problem.what are your recommendations? Hi Tim, what would be your budget? Can a Barnett recruit recurve kill a deer I got the crossbow last Christmas and need to know if I can kill a deer. Yes it can, no problem. Ultimately though everything will depend on whether your aim is spot on and if you hit the vitals; without that, even the strongest crossbow won’t kill a deer. As far as the kinetic energy of the Recruit goes, however, it’s enough to get the job done. Tim, I’m 61 with Parkinson’s. Crossbow has put me back in the game. Two shots two deer. Shooting an inexpensive Wicked Ridge Warrior with 125grain Spitfire mechanicals. Do not by a inferno blaze crossbow. I got a brand new one shot it yesterday 15 shots worked fine. Got in the woods today loaded it then heard a loud noise another noise then a limb broke in half. The manufacturer said limbs break i could get one then would have to pay to get it fixed.They are 40 miles away you’d think they would do more. My hunting weekend ruined. Affordable is relative but for me $400 was the limit. Bought a Wicked Ridge Warrior through Amazon. Out of the box was 2″ left and about the same low at twenty. Quickly sighted in. Clustered 6 arrows in a 2″ circle. Gave to my 14 year old daughter to try. First shot bull, second shot Robin Hood! I have had 2 shots at deer. Had two kills. 125 grain spitfires. I don’t see how you can do better for the money. I bought a SAS Chopper 175 lb and around 280 fps. It cost $299 w/free shipping from “The Crossbow Store. IIt has 4 arrows, Quiver and rope cocker w/a 4×32 scope. I really like it. I am looking for something powerful and reliable. I’m willing to pay the price for that. What would you recommend for a female (5’6″)that fits the bill? Hi, I am looking for a cross bow to hunt white tail deer in the mountains of VA. I am willing to spend $400 max, what would be your number one and two choices that you would recommend? Hey guys, I just bought an inferno fury from a guy for $125 (he needed grocery money) I just got done sighting it in at about 25yds, with two in the bulls eye and one just outside up and left, I was reading some of your article about them and saw about the scope(didn’t come with one) first off would the x-bow be a decent starter one for me hunting deer and secondly can you recommend a scope to me for it I’m on a serious budget, but want a decent scope. For 2017, TenPoint has the reverse cam Eclipse RCX, which is rated at the same 370 fps for $100 less than the Stealth FX, whether with the 2:1 ACCUdraw 50 or $100 more expensive crank ACCUdraw cockers. More importantly, the Eclipse’s reverse cams give it that speed with only 140 lb draw weight vs the Stealth’s 185. The Eclipse is significantly quieter and for many shooters the much lower draw weight will eliminate the need for the more expensive, slower, boat winch sounding crank cocker.